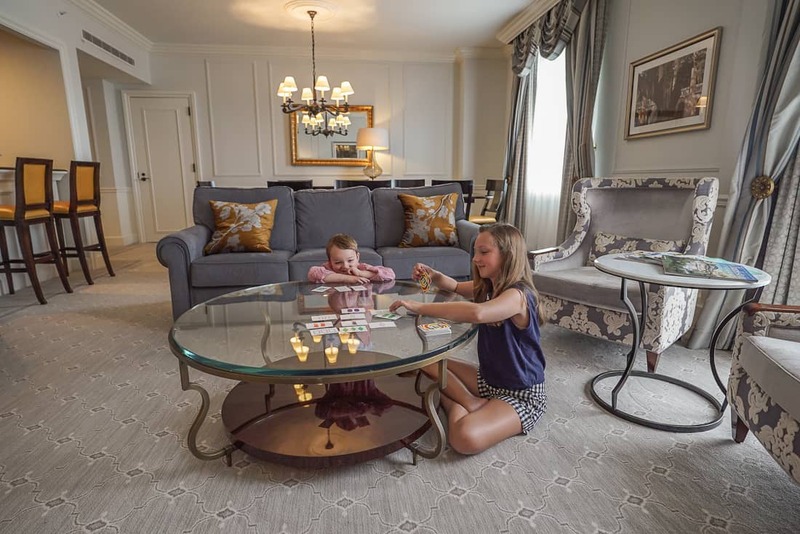 The Belmond Charleston Place hotel puts you in the heart of the Holy City’s historic district with five-star family touches. 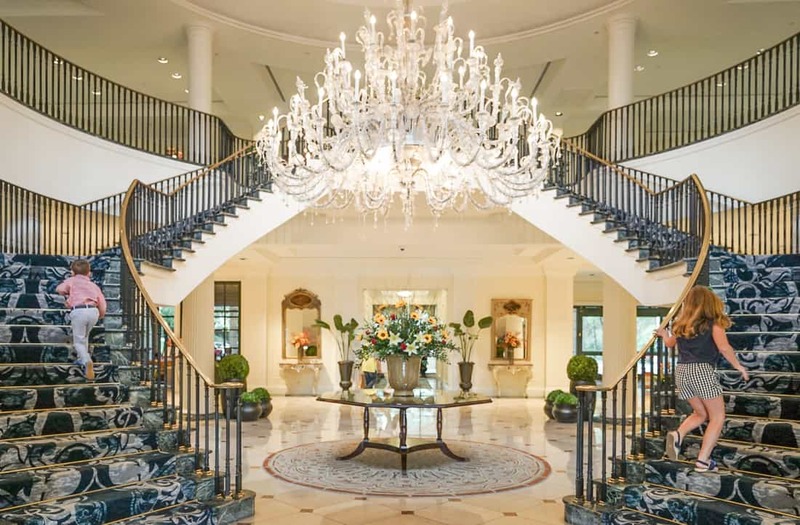 The Belmond Charleston Place is a relatively young hotel in one of America’s oldest cities. Despite the impression the grandeur of the hotel’s common areas makes where classic Southern style reigns, it opened in the 1980’s. 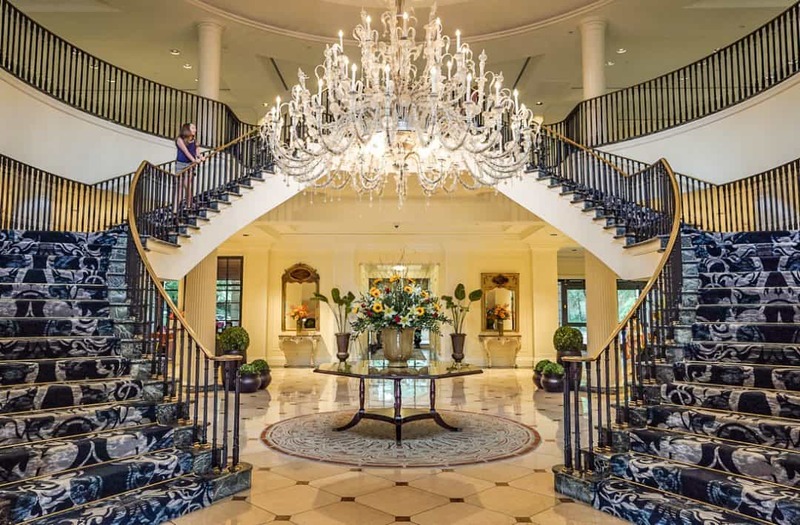 Charleston Place has been a Belmond hotel since the 1990’s. Formerly called the Orient-Express Hotels, Belmond is a brand of hotels, restaurants, and luxury train tours around the world. Its portfolio is impressive. I can’t wait to explore more of their properties. 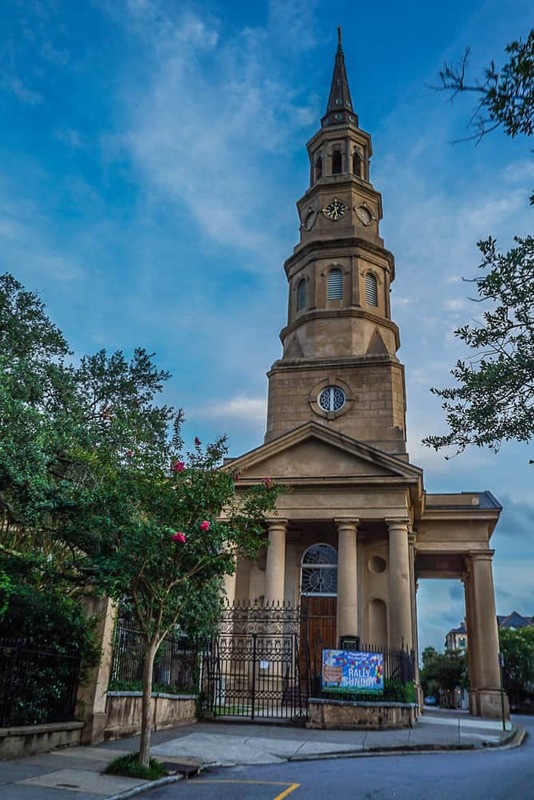 Charleston Place is well located to explore one of America’s most beautiful cities: shopping on King Street, restaurants of the French Quarter, the museums, and College of Charleston. The hotel entrance isn’t street front. After turning into a discrete entrance a large fountain with towering bronze horses greets guests. 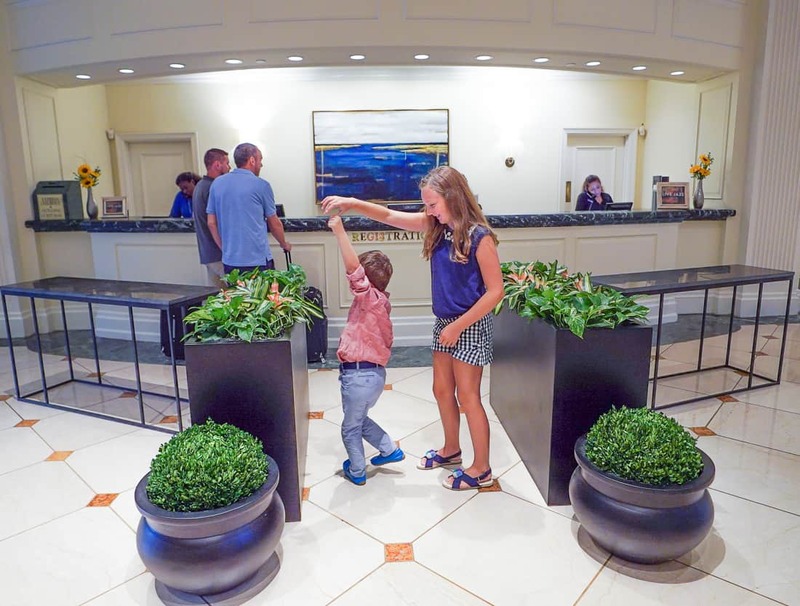 Checking into the Charleston Place hotel is worthy of a little dance. A massive Murano chandelier, weighing nearly two tons, illuminates the open Georgian staircase in the lobby. It’s a spectacular design statement that your children will race up and down. Admit that you would, too, if no one was watching. The staircase area becomes to focal point of the hotel’s holiday presentation with a massive train display paying homage to Belmond’s luxury train collection, and we’ve featured it as one of the 17 Best Hotels for an over-the-top Christmas. Take a Belmond luxury train to Machu Picchu. 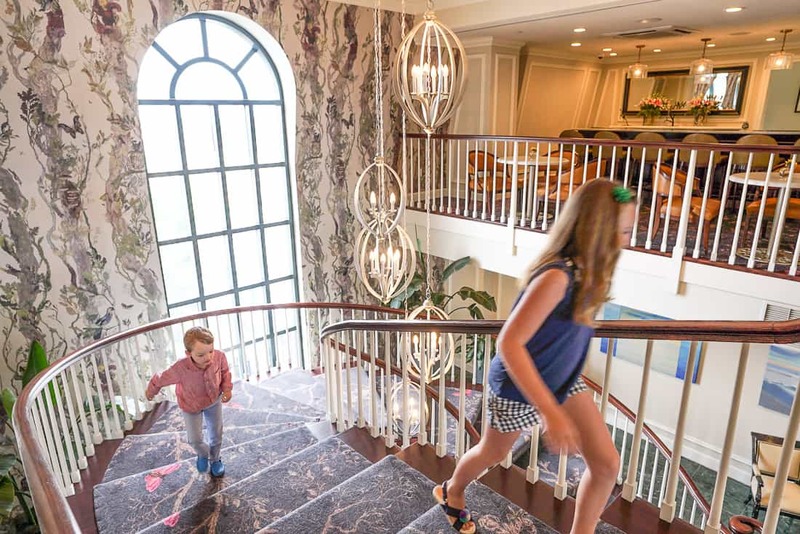 Because of the quality of the restaurants and lounges off every direction of the massive lobby, Belmond Charleston Place just feels like the center of the action in town. Even though newer hotels have popped up and adorned all of the right magazine lists, Charleston Place is a modern grand dame that has already earned its timeless status above trendiness. It’s somewhat impossible not to run up the lobby staircase. The Palmetto Cafe is a family friendly option for breakfast or lunch. Airy and elegant from its glass ceiling and atrium, I saw a Friday lunch crowd of hotel guests do locals enjoying attentive service and upscale Southern influenced fare. 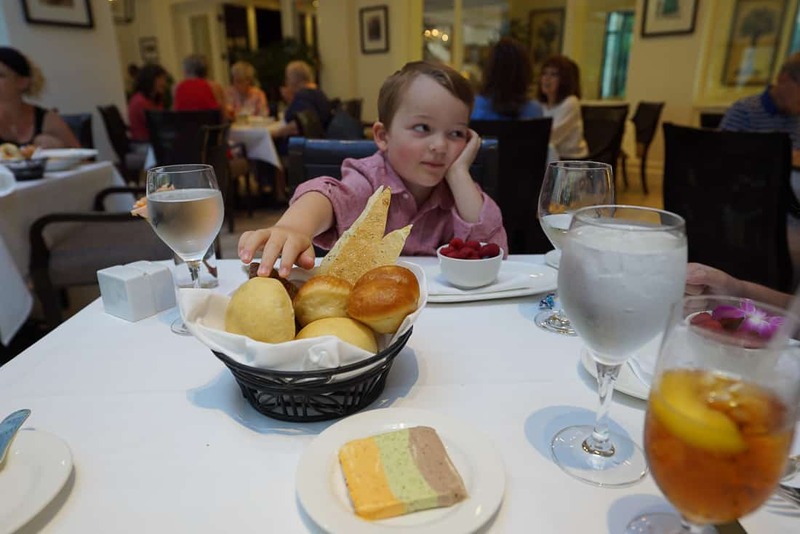 My children were offered kids’ menus, and the staff were able to offer a fruit cup appetizer at my request to keep them from devouring a particularly artful bread basket and terrine of flavored butters. It didn’t work. Not sneaky enough for Mommy. My daughter enjoyed a fresh presentation of a Caesar salad served within a circular crouton and a mini 21 Club burger. My gazpacho and scallops were excellent, too. And yes, my son ate that entire bread basket. 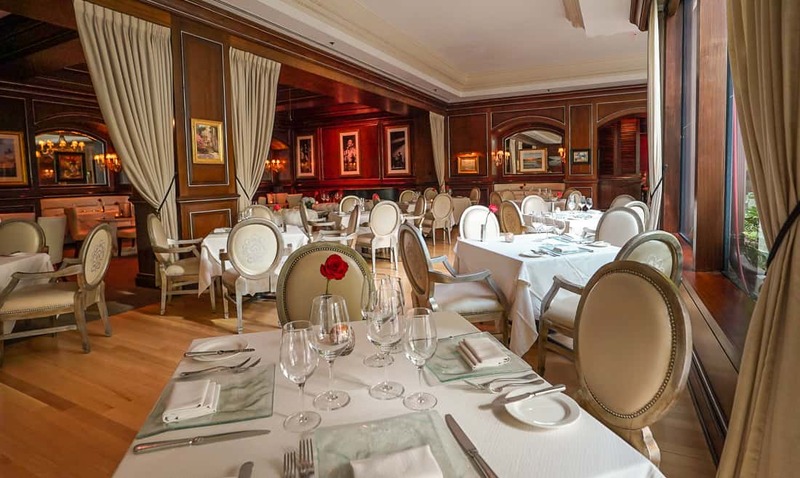 The Charleston Grill is the dinner-only restaurant that looked like a great option without the kids or with enough grownups in the family to keep them engaged for an elegant meal in the wood paneled room. The Charleston Grill is the formal dinner restaurant. The excitement of opening a hotel room door the first time on a trip. The hotel’s rooms and suites are remarkably generous. “Did you see that cute pic of the kids in our suite?” I texted. “Oh, I thought that was the hotel lobby,” replied my husband. The Charleston Place Suites are big and beautiful. Tall windows appointed with layers of silk damasks and gold tassels have small balconies for a view of Charleston’s Harbor. 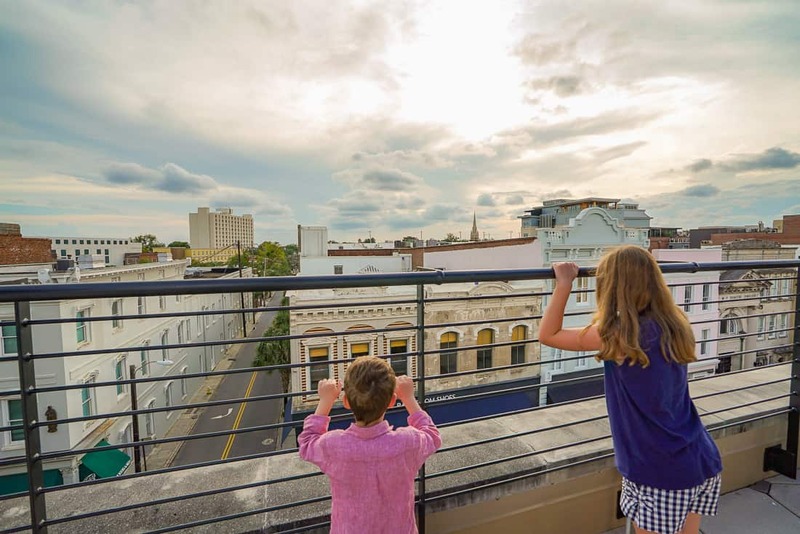 The Charleston Place Hotel Suites are expansive and easy for families to spread out and enjoy. Wet bar areas offer extra refrigerator storage for snacks and drinks, and a wine refrigerator can hopefully keep more than bottles of milk. Our suite had two full bathrooms and plenty of space for a family of four or five. There was no walk-in closet, however. There was a wardrobe to stand in which would have been challenging for closet space on a longer trip, though it was perfect for our needs. If you are wondering if the Club level is worth it at Charleston Place, it is. The top two floors of the hotel are Club floors, offering easy access. I found the varying food displays throughout the day extensive. It was far better than cubes of cheese and crackers. The breakfast buffet was a full hot breakfast, afternoon tea, and the evening appetizers were plentiful. I was impressed by premium ingredients like caviar or lobster in dishes. Adults could easily make an evening meal of appetizers and cocktails, though children will likely not find a dinner to satisfy them from the choices. That’s not a problem considering how many great restaurants are nearby. In between their larger displays there were snacks of crackers, fruits, and jars of cookies. My kids loved checking it out every time we left or returned to our room. Racing up to the Club Lounge to see what treats await. My experience at the Spa at Charleston Place began in the lounge which played the visual equivalent of luring white noise. 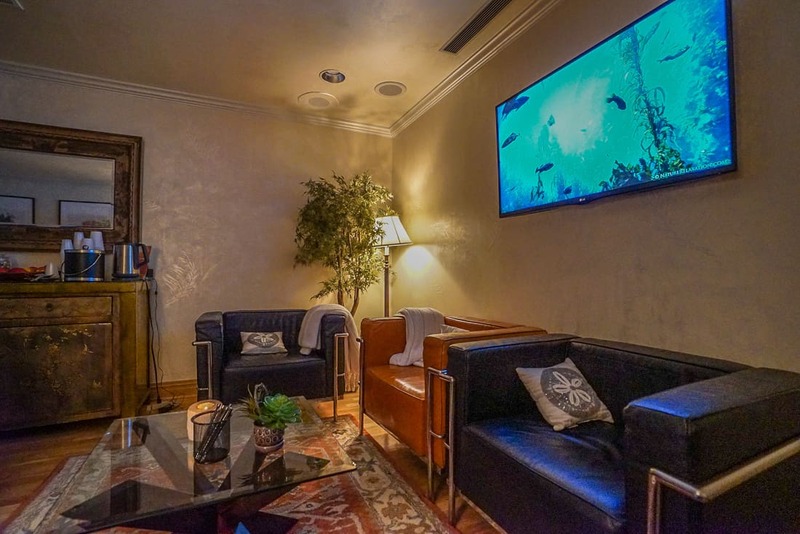 A large hi-definition television showed a film following fish who swam to a spa soundtrack. I watched this for two minutes and almost fell asleep in my chair. At 10AM after three cups of French Roast coffee. I am playing it for my kids on our next vacation at bedtime! I highly recommend the Spa at Charleston Place for a full spa break. Since the spa’s areas were undergoing an expansion while I was there, the relaxation lounge was a makeshift room, so I can’t really comment on the design of the spa. My esthetician prescribed a Skinceuticals facial as part of the Charleston Place classic facial that was the house specialty. I had heard rave reviews of the product line and tried a facial using that line before, but nothing prepared me for the quick and real change the facial was able to bring to my tired, dehydrated, flaking skin from excessive travel and motherhood. 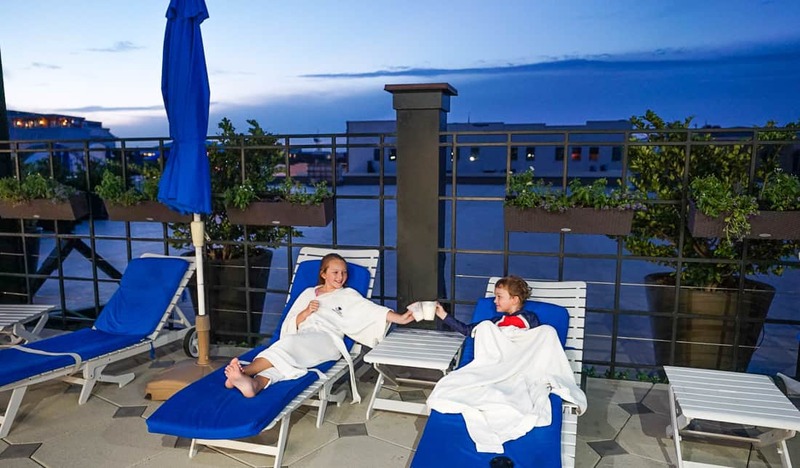 Charleston Place is the only five-star hotel in Charleston with an indoor pool, which makes it a favorite for families. The rooftop pool during the day was calm and focused on the spa clientele and exercising guests getting in laps to work off the rich local cuisine. The fitness center is off the pool area, too. But at night, the crowds of families arrived, allowing each family to relax knowing there was another group of kids louder than their own. There’s a rooftop bar and small grill off of the pool where we enjoyed two very peaceful evenings, one watching the sunset over a light dinner, and second, for a milkshake break from swimming. Enjoying a sunset and casual dinner from the rooftop bar cafe at Belmond Charleston Place. There’s something so convenient about having an elegant shopping center right in your hotel, particularly in inclement weather. The Charleston Place shops actually cover a larger area than the hotel and are scattered around neighboring streets. The variety of stores covers many tastes: Gucci, Louis Vuitton, and St. John to Kate Spade and Calypso St. Barth. Kids will love having a Papyrus and Godiva to browse for gifts, and there are two children’s clothing stores next to each other across the street. 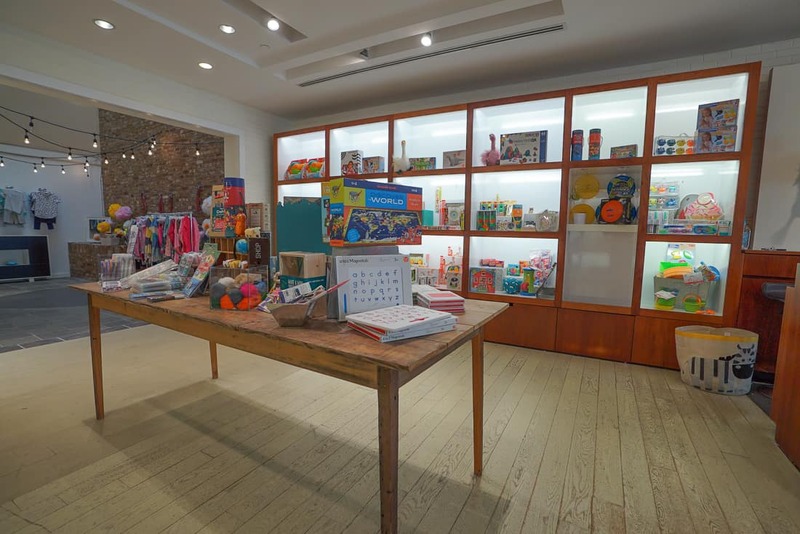 Sugar Snap Pea Kids offers an excellent selection of toys, gifts, and clothing from baby to tweens. Pink Chicken is one of my favorites for bo-ho chic pieces out of New York, and the local Sugar Snap Pea Kids was wonderful. Both my children actually enjoyed looking at their clothes and toy section while I grabbed some great end-of-season steals for next year’s swim suits. Don’t miss this gelato across the street from Charleston Place! 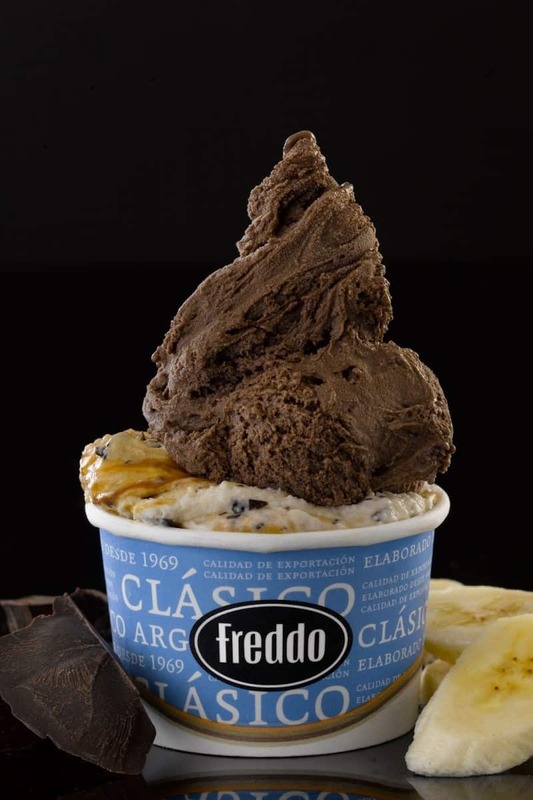 Just across from the hotel, there’s Argentina’s leading gelato company, whose only other US location is in Miami. It’s heavenly. Go. Passing S. Phillip’s Church by Pedi Cab on our trip down to the Battery. Charleston for kids is a little different, considering the city focuses so much on adult food and drink and couples. We’ve got you covered. 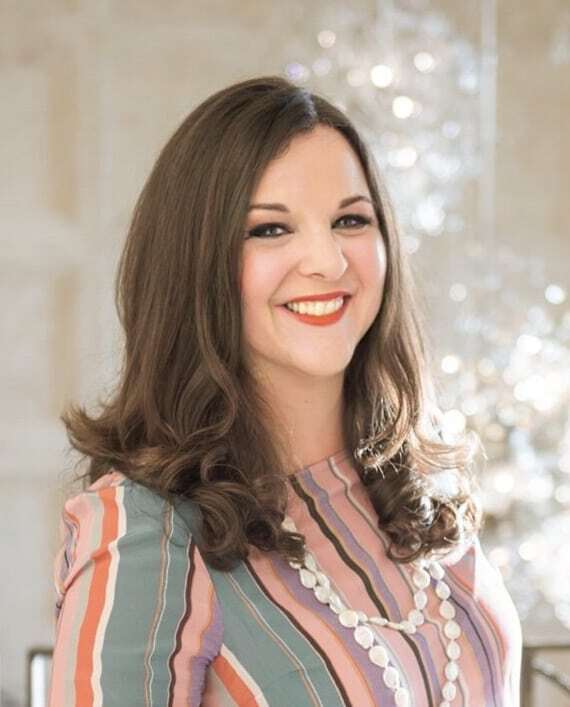 Local mom and PR specialist Annie Byrd Hamnet has outlined all of the best attractions and kid friendly restaurants in Charleston for foodie parents. 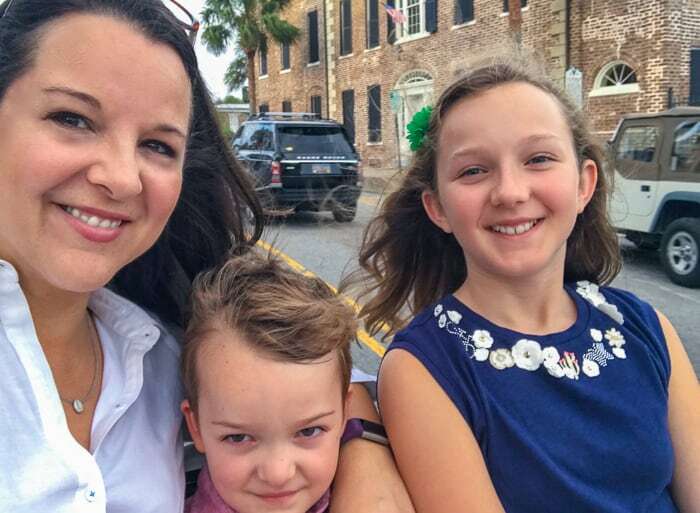 During our brief visit, we discovered just how great Pedi cabs are for families to tour the historic downtown area. We asked for a round trip ride to the Battery (the tip of the peninsula and peak of Charleston real estate) from the hotel so that we could more slowly enjoy the area’s spectacular architecture. It ran about $40 with tip and was our favorite activity. When riding in the back of a Pedi cab, everything is interesting to a 6-year-old boy. After our initial ride, my kids only wanted to take Pedi cabs. They are readily available in addition to Lyft-Uber services, so we found exploring the area to be easy when the kids tired of walking. 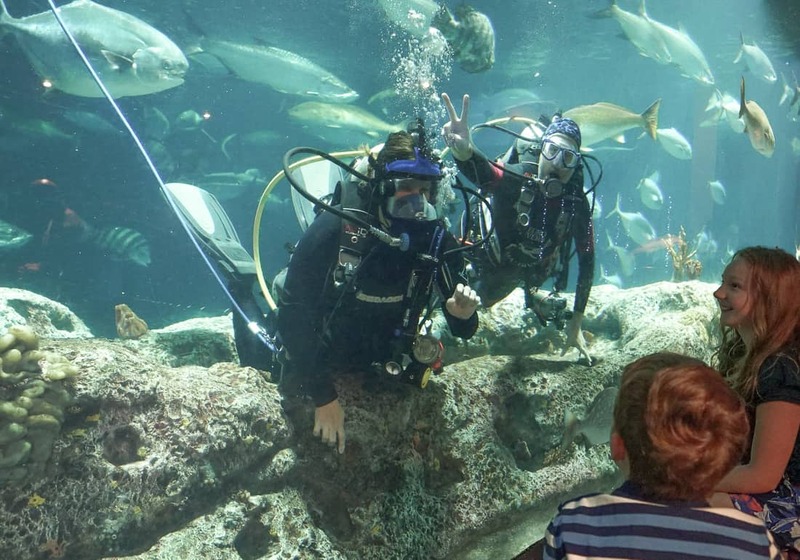 The South Carolina Aquarium is a great attraction to spend a few hours. The harbor views alone are beautiful. My kids enjoyed each of the exhibits, the touch tanks, and the hurricane wind simulator, though, admittedly that feels very wrong after our recent hurricane season. 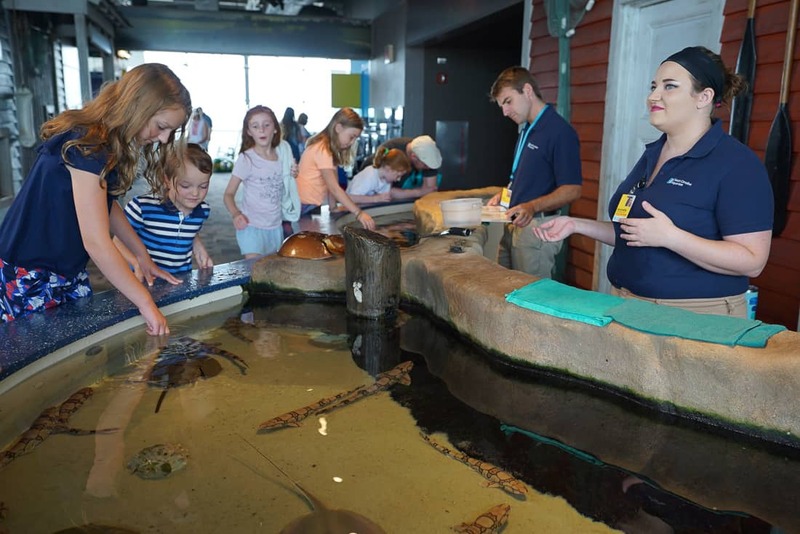 The South Carolina Aquarium offers a fun few hours with excellent interactive exhibits. We barely scratched the surface of Charleston, and I can’t believe I hadn’t yet gone to see this city yet. As a Southerner living in Boston, it was incredible to see such a spectacular fusion of architecture and culture in a walkable city. 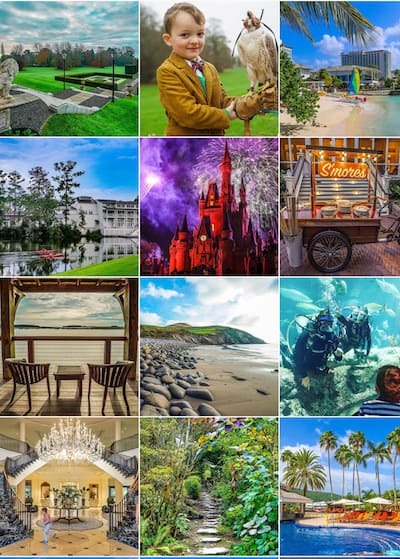 As there are many resorts within an easy driving distance, I enthusiastically recommend a visit to Charleston en route to Kiawah or the Hilton Head area. 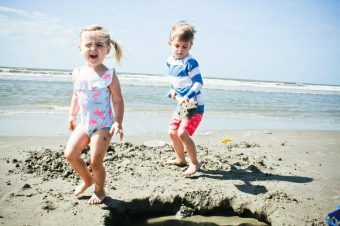 Here’s an extensive list of things to do in Charleston with kids from our friends at 365 Atlanta Family and Travel Babbo. 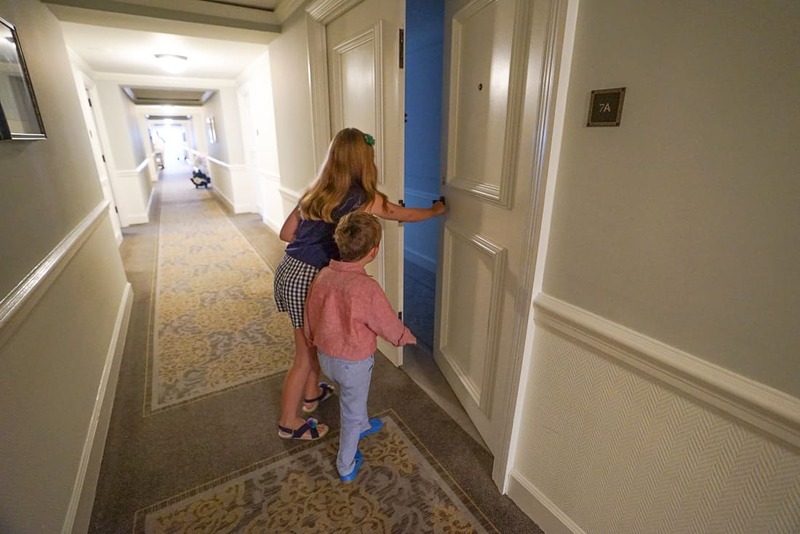 Although we were guests of the Belmond Charleston Place, these opinions are entirely my own. I hope this was the first of many Charleston Pedi Cab selfies in our family photo album.